This compact and portable Director's Armchair is a one-of-a-kind. 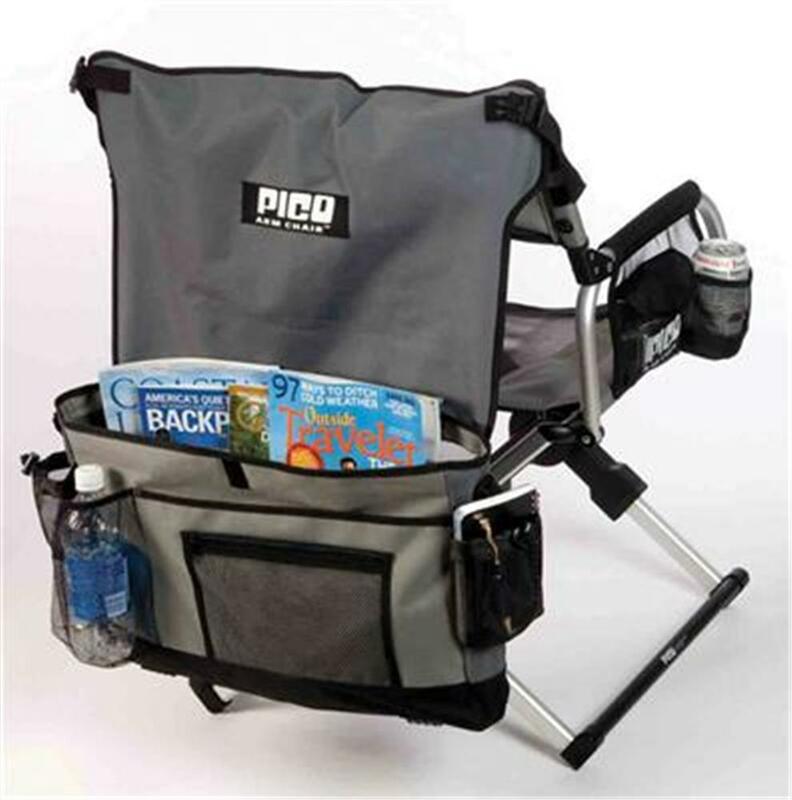 Telescoping legs and folding backrest quickly and easily fold to the size of a laptop in seconds! 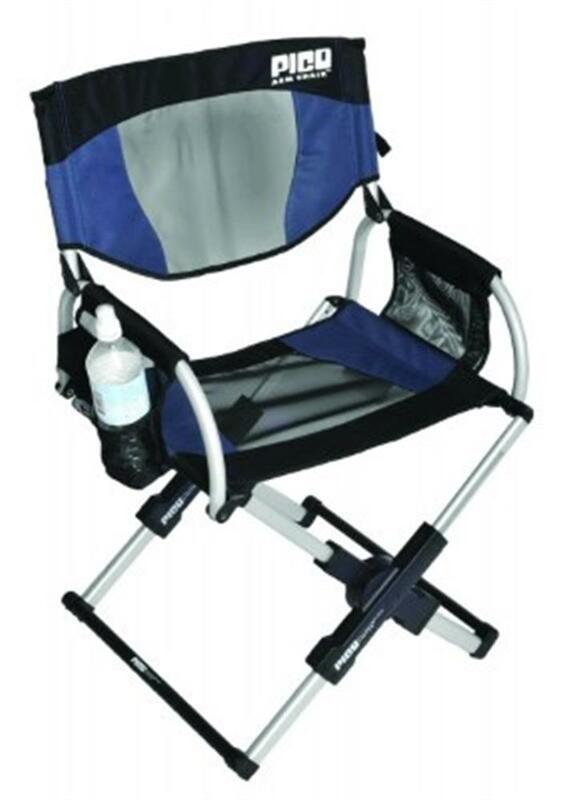 Providing comfort and convenience, the compact folding chair weighs only 9-lbs but supports up to 250 lbs, thanks to its rugged aluminum and steel frame and 600-denier nylon mesh seat. 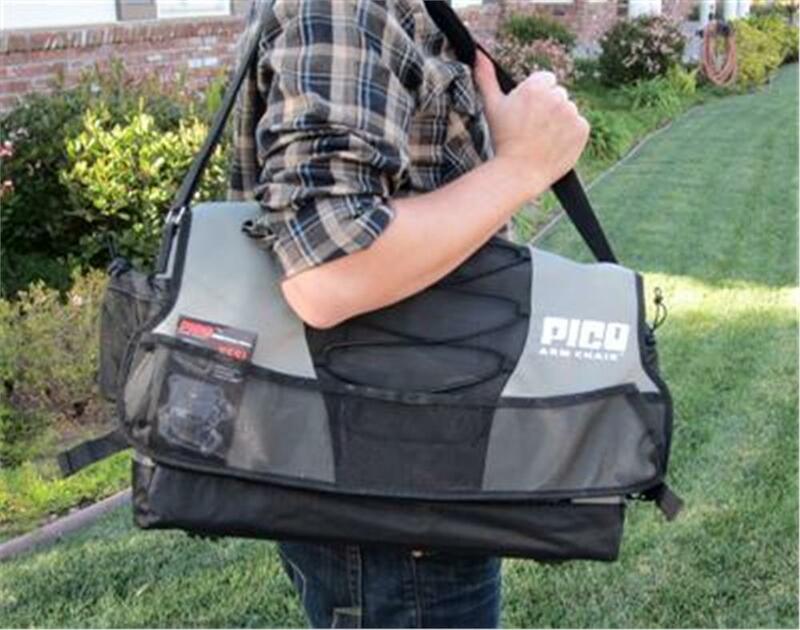 The messenger-style storage bag slips easily over your shoulder for easy transport at any outdoor activity or event. 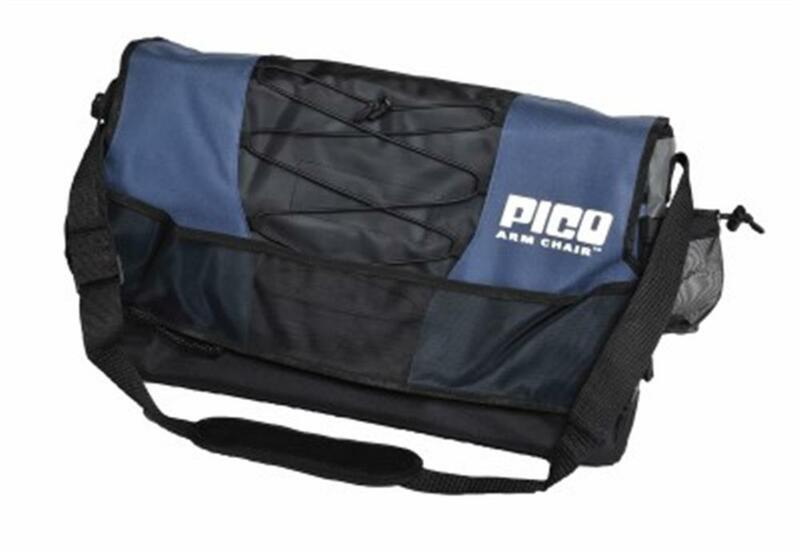 The bag also doubles as a storage caddy with multiple pockets and 2-integrated drink holders. 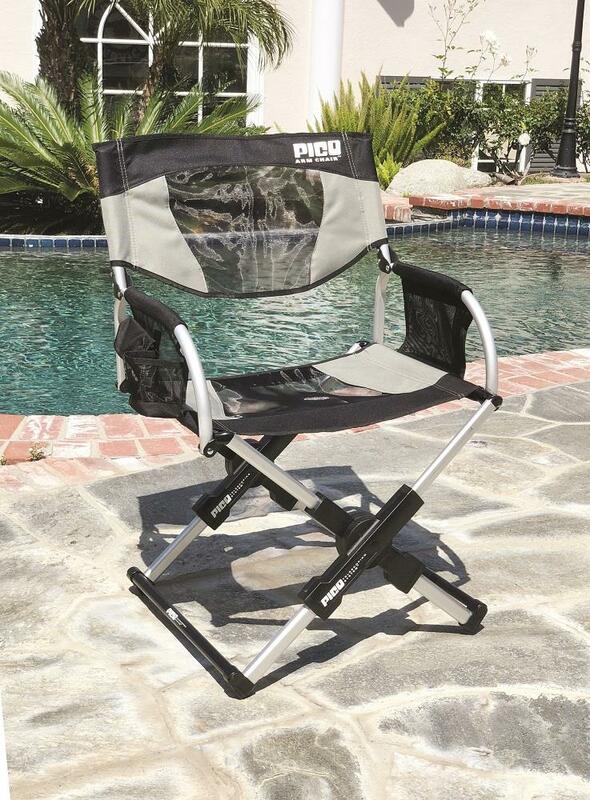 The GCI Outdoor Pico Folding Director's Chair is backed by a limited lifetime warranty. You can clean your product with a mild solution of soap and water. If you use your product at the beach, please wash down with fresh water before storing. To qualify for any GCI Outdoor (GCI) warranty, products must be registered in the GCI product owners’ database. Click here to register a product and complete the online product registration form within one month of purchase. The GCI limited warranty applies to GCI Outdoor/GCI Waterside (GCI) branded products only. GCI products are warranted against defects in material and workmanship for the following durations with registration of the product. GCI products are solely intended for personal and recreational use by one person at a time, unless otherwise specified, at or below the recommended weight capacity rating. Anyone with physical limitations or concerns about any existing health conditions should check with a health care provider prior to using any recreational products. The GCI limited warranty is in lieu of all other expressed warranties, obligations or liabilities. The duration of any warranty is implied by state law, including, but not limited to the implied warranty period, merchantability and fitness for a particular purpose, to one year from the date of original purchase. Some states and countries do not allow limitations on length of implied warranties, so above limitation may not apply to all consumers. This gives the consumer specific legal rights, depending on state or country of residence. 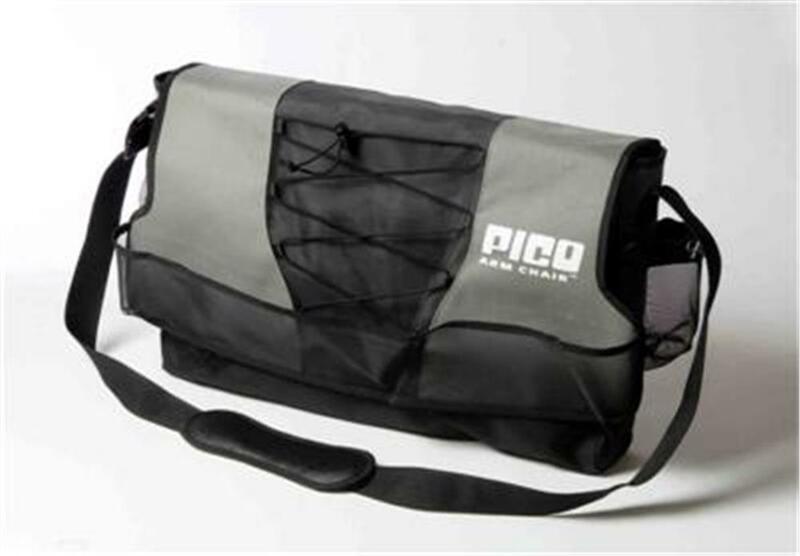 Defective merchandise requires a Return Authorization (RA), provided by GCI. RA’s can be obtained by calling 860.345.9595 ext. 709 or emailing warranty@gcioutdoor.com. Defective shipments must have the provided RA information marked clearly on the outside of the shipment. A replacement, repair or refund (at GCI discretion) may be obtained by returning the defective product to GCI with accompanying letter of explanation and proof of purchase. Any product returned to GCI for any reason must be shipped using pre-paid and trackable freight. Repaired or replacement products will be shipped by GCI using ground delivery service at GCI’s cost. If expedited return is requested, customer is responsible for the cost difference of GCI-preferred ground delivery service and requested expedited service (e.g., UPS Next Day Air®, UPS 2nd Day Air®, UPS 3-Day Select®, etc. ).